Paul Cook is refusing to buy into the theory tomorrow is a good time for Latics to face QPR. The Loftus Road outfit are rock bottom of the Championship without a point from their opening four games. And while Latics are on a roll after a string of impressive performances – and Wednesday’s 3-0 demolition of Stoke – Cook is keeping his eyes open to the threats in Steve McClaren’s side. “There’s no such thing as a good time to play any team,” said Cook. “Any team in this league carries a calibre of player that, at any given time, can hurt you. “We’ll just keep working hard, doing what we’re doing and see where that takes us. I see QPR have signed another couple of players this week to bolster the squad. But Cook is also pleased to see his side catch others off guard as they have tussled with some of the biggest clubs in the Championship already since their promotion from League One. “When you come up into a league like we have, there’s not a lot expected of you,” he explained. “And I think that can be an advantage if you use it right. “Look at Stoke, coming down from the Premier League – a completely different position to what we’re in. “But logically there has to be a period of transition for every club to acclimatise and go again. Wednesday night’s victory also saw Latics keep a clean sheet for the first time this term, and after having leaked seven goals in their opening three games, Cook was pleased with the proof his side’s defence is up to the mark. 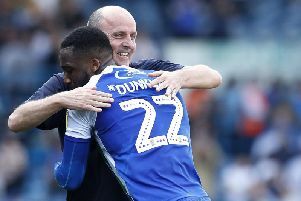 Having made the point before last weekend’s 2-2 draw with Nottingham Forest that mistakes are more readily punished by opposition players in the Championship than in League One, he won’t be changing the style of play. “We’ve conceded very late goals in both of our last two games, and people have been questioning our defence, and our defending,” he said. “But the goals we’ve conceded haven’t been bad defending, they’ve been bad mistakes – and there’s a big difference. “Everything gets judged in one game now doesn’t it – and people will be saying they’re good defenders because they’ve got a clean sheet.